Welcome to the Drug Policy Forum of Wisconsin Home Page, and home of the DPFWI discussion list. Founded November 1998, the Drug Policy Forum of Wisconsin is a virtual organization consisting of a diverse group of activists from all over Wisconsin who understand that the so-called "war on drugs" is a failure and that it is time to adopt a more humane approach to drug policies. While the emphasis of DPFWI is on cannabis, particularly of the medicinal variety, all areas of drug policy reform are represented. The Drug Policy Forum of Wisconsin website is one of a family of Wisconsin drug policy reform websites hosted by the good folks at DrugSense.org. These days, the DPFWI website functions as more of a historical archive of WI drug policy reform. The DPFWI discussion list continues to provide a forum for drug policy reform talk in WI. Madison NORML is another member of this family, and offers a blog with commentary and news on cannabis related news in WI. In addition, Is My Medicine Legal YET? is a medical cannabis only site. There is also a website for Wisconsin NORML, as well as a couple non-DrugSense hosted sites, the home page on My Space of Madison's Great Midwest Marijuana Harvest Festival, held each fall. HF 2008 will be the 38th incarnation of this historic event. Finally, there is a Madison NORML page on Madison.com's Community Pages. 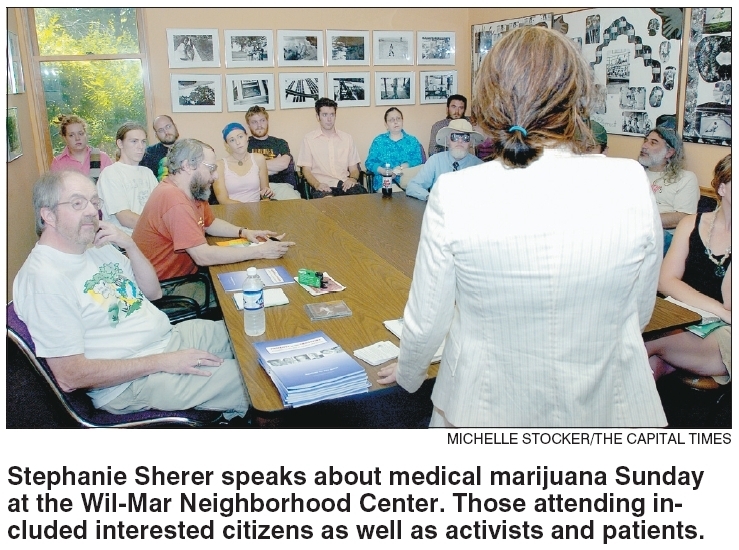 There is also a Facebook presence for IMMLY and WI NORML. These sites are mostly edited by a single volunteer, so please bear with us if a page has not been updated as regularly as would a site with proper funding. The DPFWI mailing list provides a place for Wisconsin activists to discuss developments and strategies regarding drug policy reform in the Badger state and beyond. The website is also intended to be a resource for those interested in furthering drug policy reform in Wisconsin. Check out the Activist Calendar for upcoming events in Wisconsin and vicinity. Visit the News page for links to articles about recent developments in Wisconsin. And be sure to visit the Medicinal Cannabis pages, chronicling the drive to enact legislation to protect state patients who benefit from this therapy. Read Rep. Underheim's new bipartisan Wisconsin medical marijuana bill AB740. March 23, 2005: Madison NORML Blog: Ordinance 23.20 turns 28 April 5 -- The next step: Tax & Regulate? March 2 2004: Madison Medical Marijuana Awareness Week proclaimed by City Council! Greens and Libertarians agree: Legalize medical cannabis NOW! Listen to DPFWI WORT Access Hour archived radio programs online! More Pictures from Harvest Fest 2002! Pictures from the 2002 31st Annual Great Midwest Marijuana Harvest Festival which was held Saturday and Sunday October 5 & 6, 2002 in Madison Wisconsin. Medical Marijuana Bill introduced in Wisconsin. AB 715 Introduced 14 January 2002! See: Medicinal Cannabis in Wisconsin (updated July 15, 2002). This website and the DPFWI are hosted by MAP/Drug Sense. Follow this link to find out more about DPFWI, MAP and Drug Sense, and how you can make a difference in this effort.